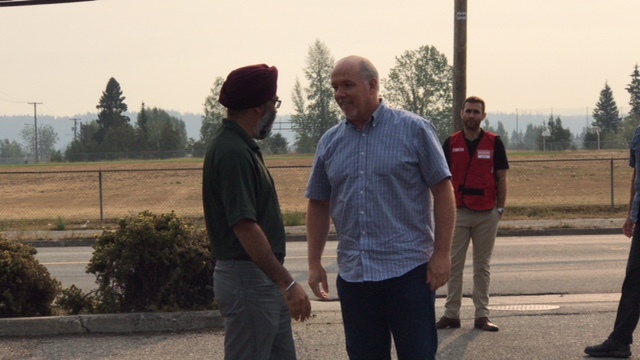 Premier John Horgan is in the Northern Capital to tour the current BC wildfire situation. He is joined by Defence Minister Harjit Sajjan, stressing they understand how tragic this situation is for people and the frustration they are hearing. Sajjan also added the Canadian Armed Forces are deployed with 300 personnel on the ground, with 250 being apart of the Land Task Force. Fires such as the Shovel Lake wildfire could be the new norm because of the way we treat our forests says the Premier. Horgan was also asked about how much climate change has been a part of this situation, stating his government is trying to adapt to the changing conditions. As of note, the current wildfire situation has reached over $200 million with the Premier saying they will have to dip into surpluses to help with costs. He added whatever dollar amount is needed will be there and he doesn’t believe it will affect the budget. There are just under 600 fires burning across the province as of note.